Each month, the IQ Group team comes together to share knowledge and acknowledge achievements. This time together is always a great opportunity for us to find out more about the wealth management industry and what IQ Group is doing to help our clients create the best possible future. 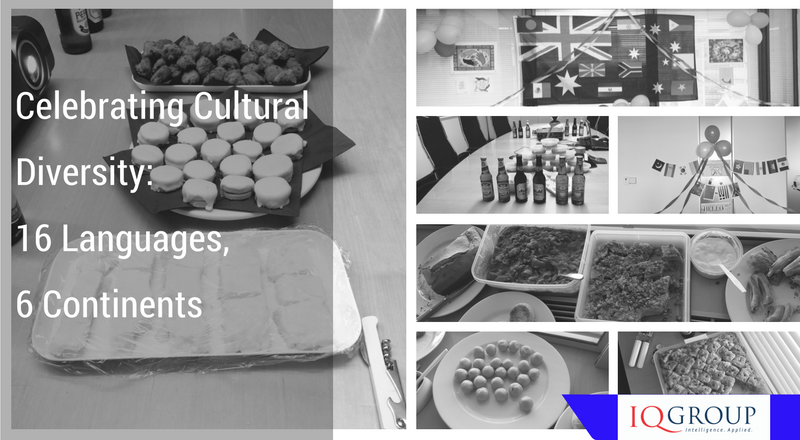 This month we also took the opportunity to celebrate our collective backgrounds, learning more about each other and celebrating the international diversity of the IQ Group team, with more than 16 countries represented from across 6 continents. American Chef James Beard once said that “Food is our common ground, a universal experience”. And what better way to celebrate our diversity, than with food! With dishes from many cultures, the team was keen to try new flavours. From Aussie meat pies, to Malaysian Yam cake, South American Chili and South African Biltong, there was plenty to share. It was great to take the opportunity to share stories of childhoods in other countries and experiences that have led each person to Australia and IQ Group. IQ Group is proud to have such a skilled and talented team. 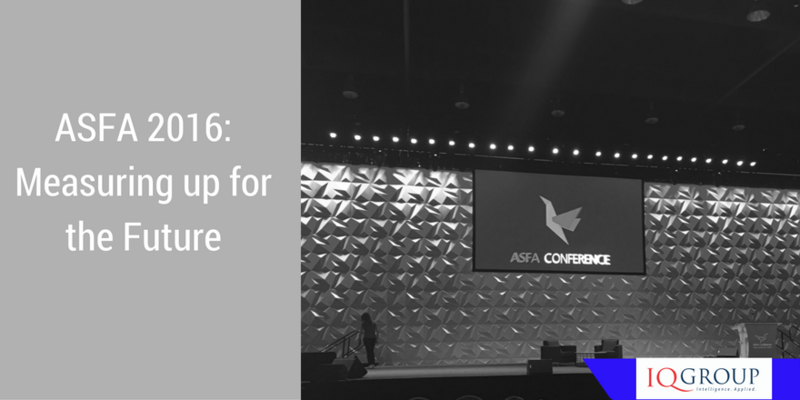 Wrapping up last week’s ASFA 2016 conference saw Financial Services Minister, Kelly O’Dwyer, address an audience that had experienced two solid days of considering whether the super industry in fact did ‘measure up’. For many of us that attended this year’s conference was a departure from the review of where we were heading and instead reminded us that we are part of a larger industry and economy, with some very large responsibilities to the end member – from both a fiduciary and also quality of life perspective. The Minister outlined the goals to modernise our retirement income system, particularly superannuation, ‘making sure it works for everyone’. The government’s own superannuation reform package had been introduced to Parliament less than 48 hours before her address, focusing on delivering a flexible system that could accommodate a wide range of working arrangements and patterns that people experience during their lifetime. Objective of superannuation – a bill to enshrine in law the objective of superannuation — which is ‘to provide income in retirement to substitute or supplement the Age Pension’. This is, the first time Government has had such a clear definition of what our superannuation system is intended to do – and importantly what it is not there to do. It is about increasing the number of Australians who are self-sufficient in retirement. It is not about estate planning. It is not about tax minimisation. Flexibility of the system – Designed to improve the superannuation balances of more than 800,000 Australians, the Minister highlighted the challenges that many of the ‘hardworking’ and ‘aspirational people’ have different and broken work patterns dependent on their jobs and family circumstances. A level playing field for the self-employed and employees will allow the annual concession cap to be accessed, regardless of your employment arrangements. CIPRs – And more choice means more development of income products for retirement. Developing a framework for CIPRs is key to support Australia’s rapidly aging population. The 2015 Intergenerational Report showed that ‘by 2055, the number of Australians aged 65 and over is projected to more than double, while one in every 1,000 people will be 100 or older’. The Government will now look at ways to treat new products under the Age Pension means test, plus release a discussion paper on key policy issues for a framework for CIPRs. Future of Superannuation – The superannuation package now before Parliament was described as a ‘significant milestone’ and one that would ‘improve the equity, sustainability, flexibility and integrity of the superannuation system.’ The Minister outlined the reform agenda would remain ongoing, particularly in relation to efficiency and competitiveness and the Productivity Commission will complete its delivery of its final report for stage 1 shortly, with a draft for stage 2 released in the first half of 2017 – now only 6 weeks away. And post the full implementation of the MySuper reforms 1 July 2017 a full review into efficiency and competition will be completed. With the Government’s continued focus on improving performance and confidence in the system – and a heads up that insurance in superannuation is next on the radar – 2017 is shaping up to be another year of transformational change for us all. Amidst the world of legislative change that the superannuation industry continues to operate in, it is clear the focus of strategic priorities centres on developing and supporting capabilities to drive member outcomes. From basic member information and account balances to member investment and contributions transaction and advice, the development of member portals continues to be on the rise. Basic functional capabilities for online portals have been around for a while and include things like view personal details, account balance, investment option balances, insurance, transactions, statements. Most member portals also have transactional capabilities – contributions, investment switches, nominate beneficiaries etc. Pretty much all funds have this, and with legislation like SuperStream, these capabilities have been commoditised – having the basics right is non-negotiable. I recently asked a number of our consultants for their view on the priorities and next steps for funds as they continue the digital journey. Here is what they had to say. The information a fund has and how it is used to enrich the customer experience is a significant part of building our digital future. Data-mining member’s digital activities alongside their member profile will help determine which components can be used to help build that customer journey – all while maintaining privacy. As a great example of both using data and building customer experience, an investment website I like to use recognises that I check the rolling investment performances regularly so when I’m next there it takes me directly to that page and tailors its messages to me. I know that I’m still a segment but it doesn’t feel like that when I’m there – It’s a bit like the Apple ‘wish list’. Actively looking for opportunities to enhance self-service opportunities on a member portal should be key in developing any transactional capability. Taking into account Know Your Customer and privacy legislation there is still so much that can be done online using existing secure identity technology. With the exception of documentation needed for special activities such binding beneficiaries and claims, most other processes that follow phone or paper workflow channels can be exposed to a member online self-service. Funds can now have ‘conversations’ with their members that they couldn’t before, via Facebook, Twitter, LinkedIn, etc. They can also help to educate members about superannuation and wealth management via websites. They can reach member’s via multiple channels (email, SMS, online, social media etc.). The next step in social media is to be present and active. Real time videos, tweets and competitions open the door to a continuing presence and help fund become more than just a future retirement plan. Opening the door on new opportunities, we are only beginning to see the true potential in the online advice space. Already robo-advice is making headways across the globe. Members are now more aware of their investments and planning for their future than ever before and financial advice is becoming a key component of the customer journey at specific life points. Funds should consider opportunities to provide online advice capability that is specific to a member’s current life experiences. Digital capability has the potential to impact the retention of members more than any other channel has ever done in years past. If a member is unable to do something or see something in one funds website but can in another, it’s no longer hard for them to change funds. Now is the time to understand your customers, enhance capability and build a great digital experience.